Oh no-no! Will Tribe's struggles nix trade efforts? You’d think the no-hitter Ervin Santana threw against the Indians earlier today would serve as the tipping point that forces the front office to make a trade before Sunday’s deadline. At least that was my initial knee-jerk Cleveland fanboy reaction upon the inauspicious end of today’s un-televised rubber match between the Tribe and the Angels. 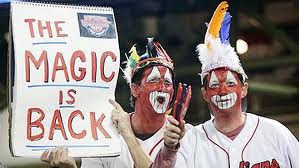 After considering it a moment, however, I’m thinking Indians brass is going to come to the opposite conclusion. That is, at least in the mind of GM Chris Antonetti and the rest of the Tribe’s deciders, today’s no-no proved just how far the Wahoos are from real contention, and that the benefit from plugging one or even two guys into this roster is not worth the cost of minor league talent. I don’t agree with this line of thought, believe me, and doing nothing at the deadline would be annoyingly emblematic of an ownership group that always seems to find reasons not to take risks, only to sit back and wonder why fans are down on the franchise. But if the calendar turns to August with Austin Kearns and Travis Buck still getting at-bats in this lineup, I’m guessing Antonetti will give us his best Mark Shapiro-like corporate-speak and say this club has “high-ceiling” players in the minors who, despite their “volatility” in terms of everyday production, are “assets” too “future-favorable” (not business-speak per se but it has a ring, no?) to part with on a team with so many glaring holes. “Now is not the right time,” Antonetti will say to the foaming consternation of sports-talk callers across Greater Cleveland. We may be angry at this predictable proclamation, and in response send a slew of pissed-off tweets into the electronic ether that nobody’s going to read, but the Tribe’s deadline inactivity will be sold to us as the reality of a team that’s living on a nightly knife-edge where every mistake is magnified tenfold by an awful offense. Antonetti can stress patience and tell us Grady Sizemore and Shin-Soo Choo will be back before the year's out. He may not be so forthright with the fact they were unproductive when healthy. Nor will he be shouting to the heavens about Carlos Santana’s unremarkable sophomore campaign, Michael Brantley's inconsistency, or Matt LaPorta acting as an energy-sucking black hole at first base. So, Antonetti has to be asking himself, Will a Ludwick or Willingham or Upton make a difference in this dire situation? Failing that, how much are we willing to give for a difference maker like Hunter Pence, whom reports indicate in not on the market, anyway? It’s a shame, because the Indians’ bullpen is probably playoff ready, although even those stalwart arms have been straining in recent days as the offense continues to struggle. Regardless, whether we like it or lump it, I’m guessing the Tribe will go into August 1 with the same basic lineup that was completely shut down this afternoon. Get mad if you like, but that's reality, or at least the reality that the Tribe will serve us should they come out of the trade market empty-handed.